Elliana Sloan putts on this green during a dual match with Covington on Thursday at Echo Hills Golf Course. Sloan shot a 44 to earn the match medalist honor as Arcanum defeated the Lady Buccs, 188-211. Arcanum’s Trevor Bailey hits a shot from this fairway Thursday during a dual match with Covington at Echo Hills Golf Course. Bailey shot a 45 and the Trojans topped the Buccs 173-208. Arcanum’s Audrey Heiser gets a tip over during a scrimmage match with Fairmont on Thursday. The Trojans defeated the Firebirds in straight games 25-12 and 25-18. Franklin-Monroe’s Corina Conley gets a tip over point for the Jets during a scrimmage game with Fairmont on Thursday at Arcanum. FM defeated the Firebirds in straight games 25-20 and 25-13. Arcanum’s Taylor Gray sets the ball up for her teammate Audrey Heiser in a scrimmage game against Fairmont on Thursday. 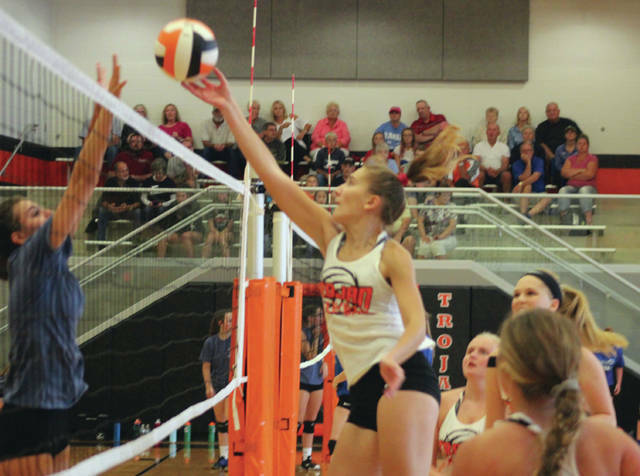 The Trojans ultimately won the two-game match with the Firebirds 25-12 and 25-18. Elliana Sloan shot a 44 and Lexi Unger a 45 to lead Arcanum in a dual match win over Covington on Thursday over the front nine at Echo Hills Golf Course. The Trojans won the match, 188-211, with Sloan as the match medalist with her 8-over-par score. Joining her and Unger in contributing to the team score was Madison Mankin with a 48 and Madelyn Wogoman with a 51. Also competing for Arcanum was Trista Hollinger (51) and Araya Musselman (59). Covington was led by Sarah Slusher with a 51. 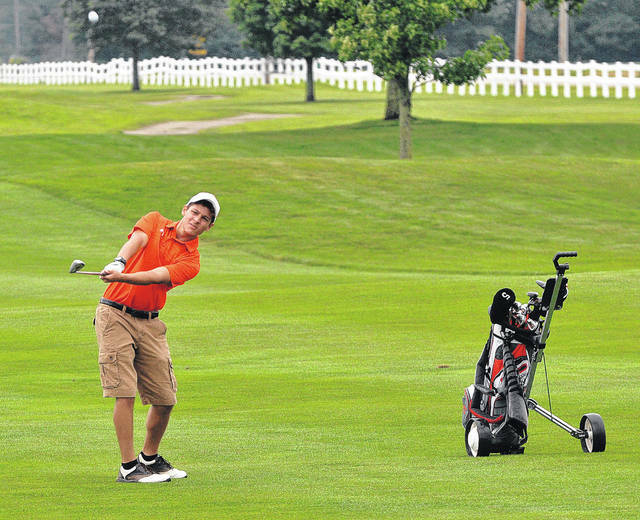 Carter Gray shot a 3-over-par 39 on Thursday to lead Arcanum in a Cross County Conference dual match win over host Covington. The Trojans won the match, 173-208, at Echo Hills Golf Course to improve to 4-0 in match play this season. Also contributing for the Trojans scoring was Trevor Bailey with a 44, Cade Brubaker, Jack Shannon and Kendall Wright all carded 45s and Evan Atchley shot a 47. 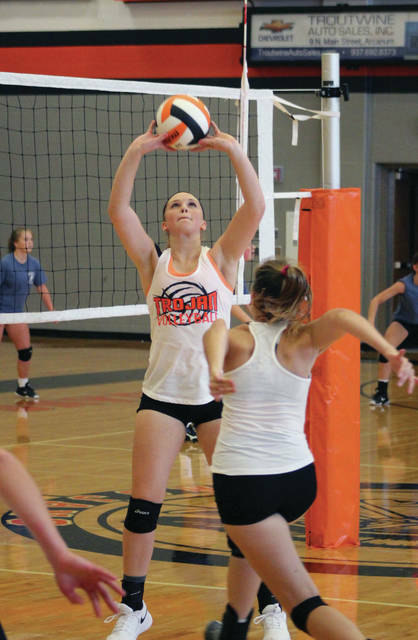 Arcanum returns to action on Tuesday against Tri-Village. 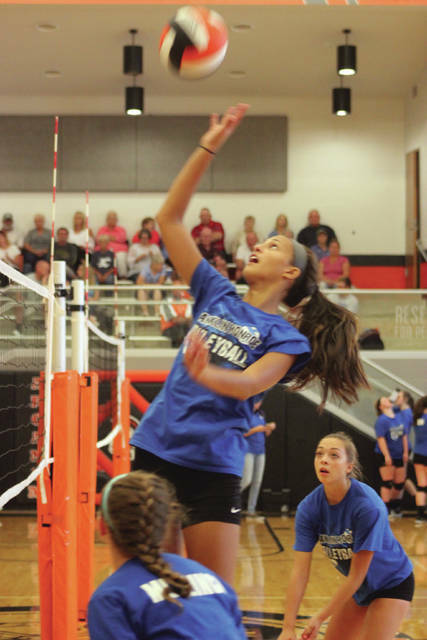 Arcanum hosted Franklin-Monroe and Fairmont in a tri-match scrimmage on Thursday night. Arcanum took on Fairmont first winning straight games 25-12 and 25-18. The Jets then battled the Firebirds also winning in straight games, 25-20 and 25-13. Then, the Trojans and Jets got together with each team winning a game. FM took the first match 25-23 and Arcanum controlled the second match for a 25-18 victory.